Trumps says only those who pledge him their loyalty and have a Trump Obedience Tattoo will be allowed into his rallies; also cites love of lightning bolts to explain design of obedience tattoo. NEW YORK CITY, NEW YORK (The Nil Admirari) - Today, Republican presidential candidate and autocratic billionaire Donald Trump announced anyone who wanted to attend his rallies would need to take an oath of loyalty to him, and either show guards what he called a "Trump Obedience Tattoo" or be willing to get such a tattoo on the spot. Trump explained the new policies were the result of protesters ruining the atmosphere at numerous rallies, and asserted he was "hugely proud" of the obedience tattoo design with its two lightning bolts. 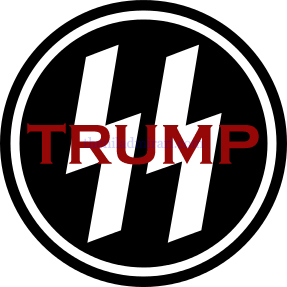 RELATED: Trump Announces Formation of "Brownshirts for Trump"
"I have had it with these people crashing my rallies, and ruining the atmosphere of unchallenged hate for my supporters. From now on, anyone who wants to attend one of my rallies needs to swear loyalty to me and have a Trump Obedience Tattoo," declared Trump from his rather gaudy residence in New York City, which had a belligerent bald eagle flying loose inside of it. RELATED: 98.6% of Trump Supporters Unable to Spell or Define "Xenophobia"
Trump continued, "And these tattoos are just so great, and my supporters are going to absolutely, completely lose their little minds over them. As everyone knows, I am a huge, huge fan of lightning bolts. They are the perfect symbol to let me, and everyone else, know who has sworn obedience to the Donald over everything else and wants to make America great again." RELATED: Trump Burns U.S. Constitution to Chants of "U-S-A"
"I mean, who doesn't love lightning bolts, am I right?" asked Trump right before unveiling the tattoo design, which boasted two disturbingly familiar lightning bolts. "Of course I am right." An unidentified member of the press asked Trump if he had designed the tattoo himself or had stolen the lighting bolts from another group that wanted to make its country great. "What a stupid question. I designed all of it myself. No one has done what I do, or what I will do to America to make it great," replied Trump. The Nil Admirari is "America's Most Swell News Source" of the spurious variety. The Nil Admirari by The Nil Admirari is licensed under a Creative Commons Attribution-NonCommercial-NoDerivatives 4.0 International License. © 2015-2017 The Nil Admirari (theniladmirari.com). All Rights Reserved.